@jondot | CTO at Como. Hacker. Fullstacker. Big data. Open sourcer. This post is part of a series about React Native Performance, and the upcoming Programming React Native Vol 2. In my previous Debugging React Native article I mentioned the MessageQueue, the SPY_MODE flag, and how I submitted a pull request that changed it effectively into a spy() function anyone can try using. I also mentioned Snoopy, a tool I built that uses spy() and creates a high-level tool that helps you with debugging MessageQueue performance problems. Today, we'll take a look at how that came to be, and how you can use Snoopy to figure out your performance problems. Inevitably, some of the components we'll adopt will make heavy use of the MessageQueue, but actually we'll never know or have the time to notice. We perceive the MessageQueue as an internal thing and (for a good reason) and to be honest we tend to treat libraries as black boxes that frees our time and let us work on solving other, more interesting, problems. For that, I had to also realize how I would pry the MessageQueue open and see it overflowing with big messages and needless communication, due to the way I was using libraries at the time. If you imagined you had to build React Native from scratch, how would that be? Let's use the simplest module I could think of for illustration: Alert. This kind of architecture exists everywhere around us, for example, we've had postMessage on the Web. 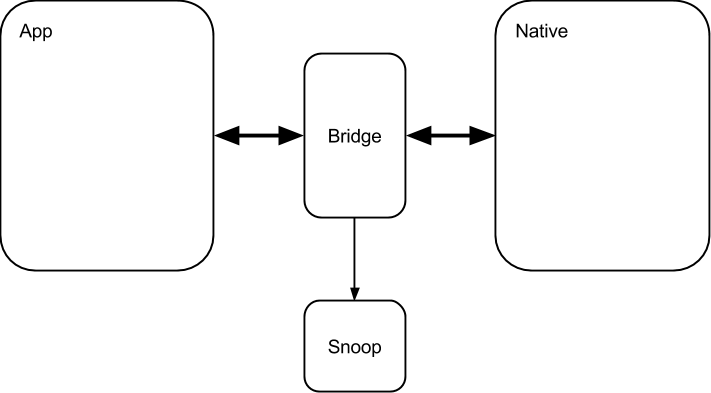 I had to hand-wave a lot of detail to keep focus, but be sure that in React Native, you have these two parts and the architecture is much detailed than what I described. When we work on performance issues, we're looking for bottlenecks. For example, high CPU usage would probably mean one or two hot areas or functions, which you can find with profiling tools. Once fixed, you can be sure a couple more hot areas will pop up, but on average performance would improve. The MessageQueue presents an interesting variant of a bottleneck. One that introduces congestion. It's implicit, like the internet connection we use, or the roads we use to commute. To take the internet connection analogy, if there's a too high rate of traffic, you'll experience slowness, and similarly, if we have a too high volume of traffic. So we have small messages with high rate, and big messages with low rate and some times the combination of the two. Have better visibility, move MessageQueue away from the implicit zone and into our comfort zone. Have a good way to analyze what we see, so we can make informed decisions. To tackle the first item, I had a plan: find a flag I can switch on, or suffer and build tracing into the MessageQueue myself. I bumped onto a flag React Native core contributors used for their own debugging purposes called SPY_MODE. But, you had to switch it on by editing the MessageQueue code. Actually, that's how the spy() function came to be. With that, we're done with the first issue. If you're running this side by side with me, you'll notice that your logs are streaming events constantly. Arguably, the best way to tame a stream of events is with a reactive framework like rxjs (or Kefir, or most, or flyd). So if we stream these into a pipe that aggregates and shapes the data, we can come to conclusions efficiently, come up with numbers that signify "good" or "bad", and automate this whole process to create our own alerts. Sounds familiar? Well, not by chance, this is the same process you'd use to tame network traffic, and, for all intents and purposes the communication through the MessageQueue is another form of traffic. Let's see how we can do the above using a tool I've built called Snoopy which was, in fact, the reason I added the spy() function in the first place :). You now have events, and we're hooked into the MessageQueue. It's a fully primed stream, onto which you can tack Rx constructs as you see fit. // with Snoopy.TO_NATIVE. Use true to log filter results. // Filter based on method: show calls dealing with 'createView'. // Filter based on arguments: using nested matching. // Filter based on a predicate: use a function. These should get you started when the stream is overwhelming. For example, filtering on createView is a great way to verify that a ListView does not create new cells, when you were expecting it the least. To surface trends, we can use the built-in graphing and aggregation helpers that ships with Snoopy called bars, and buffer. // no argument, and here it gets a "measurement" function. // is more than 100 messages per second. I picked rxjs, and not other, perhaps more pure and better performing reactive libraries out there although I did use those initially (namely: most). The main reason was that rxjs comes with rich operators out of the box, and extensive educational material. Go ahead and try Snoopy and think up new and interesting ways to shape and look the stream of messages that go through the MessageQueue. Let me know what you think. It should be dead easy now.